On January 12, President Donald Trump extended sanctions waivers for Iran as required under the nuclear deal. But he warned that he would withdraw from the deal if European partners did not agree to fix perceived flaws in the agreement. On the same day, the U.S. Treasury Department sanctioned 14 individuals, including Iran’s judiciary chief, for human rights abuses and supporting weapons proliferation. Iranian officials condemned the moves. Foreign Minister Mohammad Javad Zarif alleged that the United States was not in full compliance with the deal. 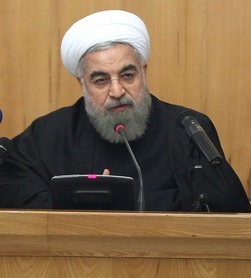 The following are excerpted remarks by Iranian leaders. "In these couple of weeks, Americans have failed in two issues. One of them is where they wanted to stand against the world's public opinion and undermine international obligations." The Islamic Republic of Iran and the international community have said that the JCPOA is an international valid document and is non-renegotiable under any circumstances. Iran will not accept any commitment beyond what has been mentioned in the JCPOA and will not accept any change in the deal either. The U.S. government, like other signatories to the JCPOA, is duty bound to fulfil its obligations under the JCPOA and must take consequences in case of violation. The U.S. decision in imposing new sanctions on the Iranian individuals and entities proves the U.S. government’s animosity towards the great Iranian nation.